Start by pre-heating the oven to 350°F. To make the salsa, heat the olive oil over medium heat in a skillet. When ready, sauté the garlic and onion for three minutes. Then add the dried chiles (without the stem), tomatoes and cumin. Cook for 20 minutes or until the chiles have softened. In a food processor or blender, process the chile mixture with the chicken broth. Pour half of the blended salsa over the chopped turkey and reserve the remaining sauce in a separate bowl. Pre-heat the oil for frying in another skillet and lightly fry each tortilla, without browning too much. Place the finished tortillas over a few paper towels to remove any excess oil. To assemble the enchiladas, dip each tortilla into the remaining salsa. Fill each tortilla with about four tablespoons of the prepared turkey before rolling up. Grease a baking dish with anti-stick spray and place the rolled tortillas inside. Pour the remaining salsa on top and sprinkle with the grated cheese. Bake the enchiladas for 25 minutes and garnish with freshly chopped cilantro before serving. If you like, you can also use chicken in this recipe. 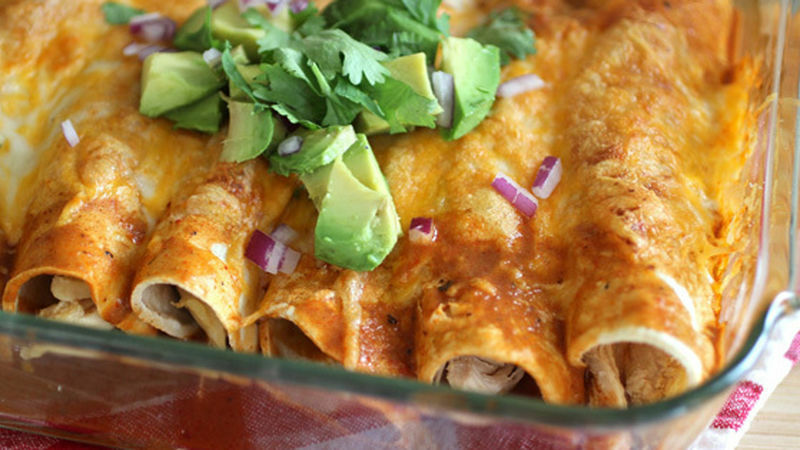 These enchiladas are stuffed with a delicioso mix of onion, garlic, tomato, cumin and turkey. Enchiladas in general are an ideal dish for transforming what's left from lunch or dinner, into a fast and rico meal. I really enjoy how versatile they are-you can change-up the recipe every time you prepare them, just by using a different combination of ingredients. With a little imagination, there's no limit to the fillings you can create. This dish is great for sharing during the holiday season, where everyone is practically overwhelmed with leftovers. In case you get a craving for these enchiladas between parties, you can always prepare a simple boiled turkey breast and shred it afterwards for preparing this recipe.